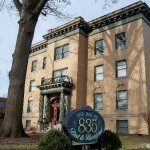 Illinois College, founded in 1829, is rumored to have several haunted buildings. Among them are Sturtevant Hall and Beecher Hall, where folks have reported apparitions, footsteps, and other noises. Beecher Hall, according to campus talk, was formerly a medical building and the top floor was a space for storing cadavers. Williams Jenning Bryan is thought to be one of the spirits haunting Beecher. The Smith House is purported to be haunted by original owner’s daughter Effie, around whom many campus legends have been spun, and Whipple Hall is home to a Gray Ghost who has no face. Ellis Hall is haunted by a mischievous ghost called Gail, who died while living here, and Fayerweather House is visited by Susie, who hanged herself in Room 5’s closet. Crampton Hall, the McGaw building and the Rammelkamp Chapel are also on the long list of Illinois College’s haunted places. I’m a senior at IC, and I can say that most of the stories on campus have no historical backing. None of the people in the ghost stories were ever proven to have existed (plus, there’s usually only a first name given in the story). That being said, I did have some creepy experiences when I lived in Fayerweather house and the supposed spirit of Susie. I was there by myself for early move-in, and my tv remote flew off the desk while I was sitting on my bed on the opposite side of the room; I heard all kinds of footsteps at all hours of the day as well as whispers. I was very glad when everyone else finally moved in. At one point, a bunch of us went into the basement and the attic to explore… Super creepy basement, especially since it was used in the Underground Railroad and there’s a hidden room down there. I’ve seen a lot of inexplicable human-shaped shadows when no one is around and heard all kinds of weird noises when the campus halls are deserted, but whether they were ghosts or mind tricks as a result of sleep deprivation, I’ll never know. Graduated in 2015 and have a few horror stories. Ghosts do.live there and we had Chris Fleming come and do an investigation. I wish I could go back and join another hunt. My daughter , whom shall remain nameless at this time , is a freshman staying in Pixley Hall . She told us of her experience at the Governor Duncan Mansion , when she was doing her community service of cleaning . She said she was vacuuming in one room and she watched a picture fly off the wall and land in the middle of the floor . She told one of the employees or volunteers at the Mansion , and they said it happens all the time , not to worry about it , it’s just the resident ghost . Needless to say , she was freaked out by this , especially since she wasn’t even half way through her shift !